It's the great cast-off migration. 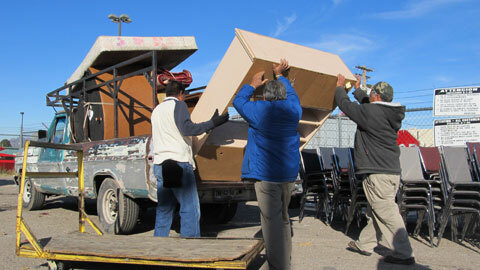 Items that don't sell at swap meets and salvation armies in the Southwest make their way to Nogales and Sonora and then south of the border. One merchant tells Inside Tucson Business that he puts his goods in storage for a day or two in Arizona and then takes it across the border bit by bit. With a little subterfuge, clothes and small items can be carried over in suitcases. Merchants at swap meets in American towns along the border report that their typical customers are Mexicans who work in the maquiladora factories that are owned by U.S. companies but operated in Mexico. "If you buy a washer here for 1,000 pesos, the same one goes for 2,000 or 3,000 in Santa Ana and beyond," one dealer told the business paper. The price gets higher the further south you go.